Bristol Motor Speedway GM Jerry Caldwell announcing that ETSU and Western Carolina will play at Thunder Valley in September. BRISTOL, Tenn.- Two other schools will be playing pigskin at Thunder Valley at the tail end of the summer. 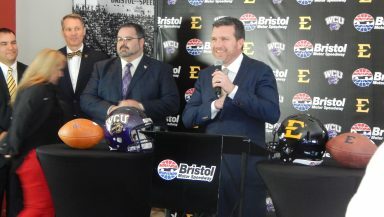 The East Tennessee State University Buccaneers will open their Southern Conference portion of play against the Western Carolina Catamounts at Bristol Motor Speedway. The game will take place on Sept. 17. Caldwell also said that only the backstretch stands will be used for this game. Thunder Valley is no stranger to hosting football games. It played host to an NFL preseason game in 1961 between the Philadelphia Eagles and the Washington Redskins. On Sept. 10 of this year, it will play host to the Tennessee Volunteers and the Virginia Tech Hokies in the Pilot Flying J Battle at Bristol.